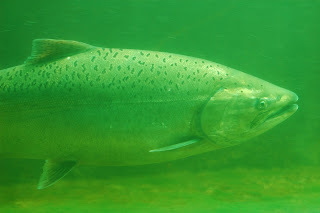 Chinook salmon are starting to come up the Chittenden Locks fish ladder. The locks are the boundary between salt and freshwater, and the fish take their time in the ladder adjusting to the change. The chinook are faring better than the sockeye that for some reason have all gone missing - only 10% of the expected run has shown up this year.